Coach Josh Matthews holds high expectations for his Lady Reddies. After losing three starters this season, two of which being seniors, Matthews is proud knowing that the girls still met his expectations. 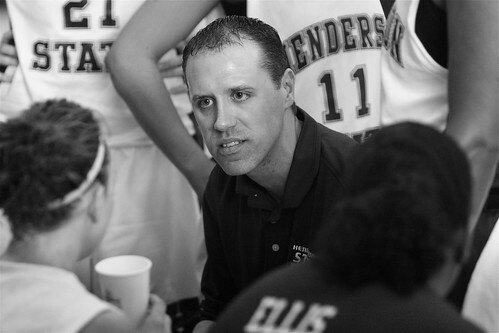 Matthews is in his third season at Henderson, but has been coaching basketball since 1997. He was hired the day school started in 2006. Matthews is 32, the youngest coach in the league by several years. Matthews did not have any brothers and sisters growing up, and spent a lot of time with his father, who was also a basketball coach. “My dad coached so I don’t really ever remember not playing basketball,” said Matthews. Growing up in Kentucky, he attended both Western Kentucky and Morehead State University to fulfill his education. Although Matthews has never coached high school basketball, he said it is similar to college. “You have expectations and you expect the kids to meet those expectations,” said Matthews. “It’s not all fun and games,” said Matthews. The work definitely doesn’t stop at the buzzer, with most days filled with recruiting calls, practice, budget paperwork and recruiting visits. A typical workday for Matthews runs from 7:00 a.m. until 11:00 p.m., and everyday is a workday. “This job requires seven day work weeks,” said Matthews. Matthews doesn’t spend much time watching the NBA, but mentioned Larry Bird as his favorite basketball player. He considers himself retired from playing the game, but still enjoys a game of golf on the side. Matthews is not married, but said his parents are there for several games a year to cheer him on. Although Matthews is friends with all the OBU coaches, he has never considered making the jump over the ravine. Matthews can always be spotted in business clothes pacing up and down the side of the court. “It is important to represent the school in the correct way and dress is part of that,” said Matthews. His boss Sam Goodwin does not ask him to dress up, Matthews does it out of his own free will and professionalism. Out of 27 games this season, twelve were away games, causing Matthews and his girls to be on the road a lot. After looking at the numbers Matthews said “there is a definite home court advantage for us.” The Lady Reddies did not win a single game on the road this season, but had a 10-3 record in their home at the Wells Center Gymnasium. The Saturday game ended the season with a loss.